ToSIA webpage http://tosia.efi.int will be unaccessible on 27th and 28th of November, 2013 due to server move. The forest industry is global, and so must be also forestry research. Lars Wilhelmsson and Jan Fryk from Skogforsk were present at the jubilee conference of the European Forest Institute in Nancy, France. 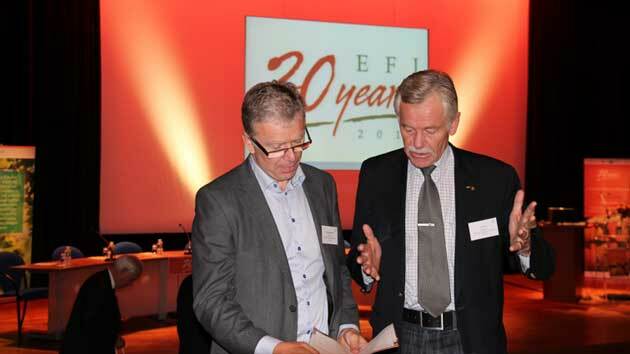 Skogsforsk was there when the EFI (European Forest Institute) celebrated 20 years of existence with a conference in Nancy, France, on 24-26 September. EFI - which is directed from the Finnish city of Joensuu and has members in 32 countries - was inaugurated in 1993 and is thus as old as Skogforsk. Over the 20 years of EFI's existence, the number of member organizations has grown to over 130 and the employees to over 150 people, spread across Europe. The Institute has also established several regional research centers, covering different parts of the European forests. Skogforsk was involved right from the start, and continued to support EFI more or less actively during the whole time. Jan Fryk, who along with Lars Wilhelmsson represented Skogforsk in Nancy, highlighted EFI's important role as the forest's voice in the EU context. EFI took part in the work to develop a proposal for a forest scientific platform (Forest Technology Platform, FTP). It in turn contributed to forest issues were given a greater weight in the EU framework research. Skogforsk had a very active role in this work. Another important link between Forestry Research and EFI is about the followup of the successful EU project EFORWOOD, which was coordinated by Skogforsk. 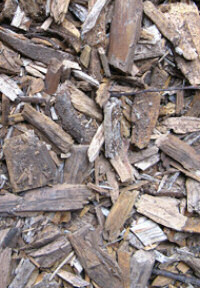 The project developed ToSIA tool, which is used to analyze the sustainability of different forest wood chains. ToSIA is now managed by EFI, but "fed" regularly with new knowledge. There Skogforsk is , represented by Staffan Berg, one of the key members. EFI conducts its own research, but above all, the Institute has a coordinating and initiating role for research collaborations within the EU. Another, perhaps more important function is to be the carrier of information between research, policy and decision makers at European level. It is about making sure that both national and international decisions affecting forests are based on a scientific basis. Trees4Future is an Integrative European Research Infrastructure project that aims to integrate, develop and improve major forest genetics and forestry research infrastructures. Trees4Future with a budget of 9 million euro is coordinated by INRA (Dr. Luc E. Pâques: luc.paques@inra.fr) and Alterra (Dr. Gert-Jan Nabuurs: gert-jan.nabuurs@wur.nl). Trees4Future runs for 4-years and it includes as part of its work program a platform for accessing a great number of useful databases, decision-support systems etc which are generously offered free of charge but subject to application! ToSIA is one of the tools offered for short or more extensive trainings. Trees4Future: Your gateway to accessing forest research facilities in Europe. Take advantage of the expertise, services and data offered by Trees4future – free of charge! Goal: The participants feel familiar with the tool, and have had the experience of making and running their own chains. 3rd TMUG Assembly will take place 8 Feb 2012 in Joensuu. More information about this has been sent to TMUG members.